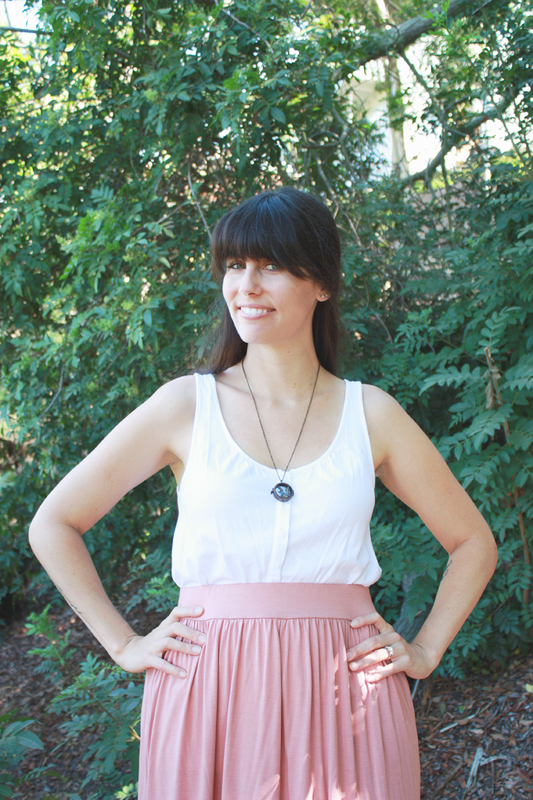 I'm so excited to introduce you guys to Jennifer of, Belle Hibou guys. It took just one look at her amazing Etsy shop and I knew I had started an instant jewelry obsession. 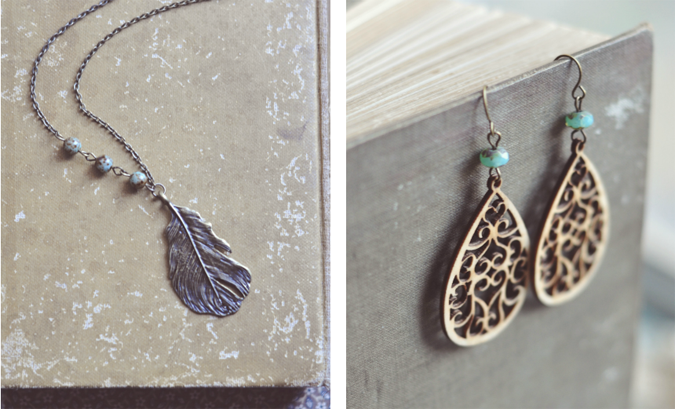 Every piece is hand crafted and inspired by nature, travel, and vintage things of the past. Right up my alley, I tell you. Take that Fields of Lavender necklace. I mean look at it! 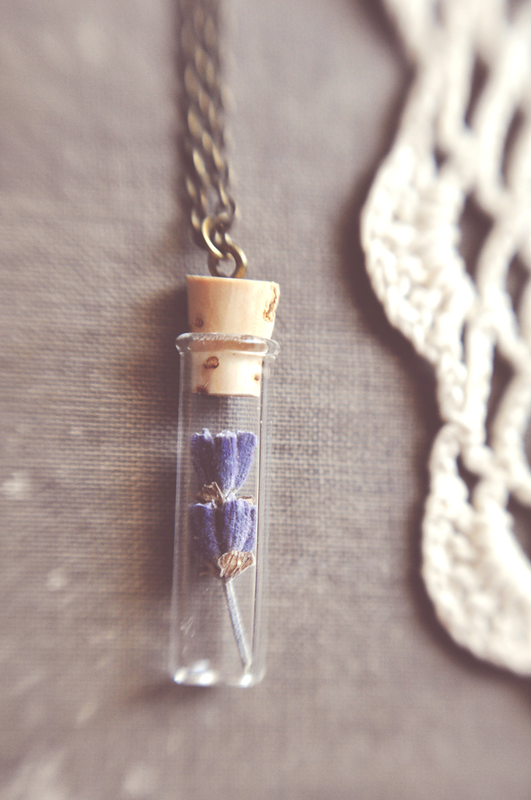 It's a tiny glass vial holding a little single sprig of dried lavender! I want them all. At 1 1/4" long, it's maybe the most precious thing ever. 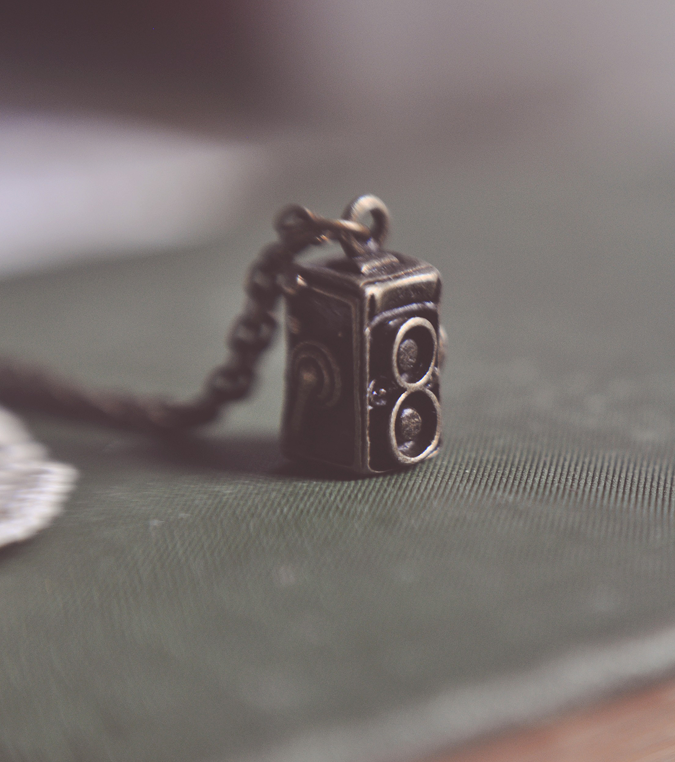 Then there's her Vintage Camera necklace...where are all my photography loving friends at? This thing is perfect! It features an old timey twin lens reflex camera and hangs from an antiqued brass chain. Swoon. If that wasn't enough, her Feathered Nest necklace tugs at my nature/animal/all-things-Native-American loving heart. This amazing necklace has a lovely 2" brass feather accompanied by three little speckled Robin's egg beads. Sigh. If necklaces aren't your thing, she's still got you covered with rings and bracelets, brooches, and earrings. On the top of my list, Jennifer's Wooden Filigree Teardrop earrings. I'm totally in love with the color of those teal beads. Surprised? They totally compliment the wood, don't ya think? I knew choosing something from Belle Hibou would be a seriously tough decision. I mean, I literally could have ended up getting about 478 things! Knowing my darling husband wouldn't have been the happiest human on earth with that, I decided to stick to one. I narrowed things down to about 3 "MUST HAVES" and then sat on that for a few days. Finally, I made my decision and went with her amazing (and I do mean amazing) Lavender Shadowbox necklace. Holy. Cow. I am so in love with this piece it's not even funny. Or maybe it's a little funny because maybe 5 years ago you couldn't catch me dead looking at jewelry. Wedding ring, ONE necklace, and same earrings I've had on for, OooOoohh maybe the last 8 or so years was ALL I OWNED. Fast forward to today and I have collected some seriously cute pieces. So many in fact that I just might need to invest in a jewelry box! Gasp. Look at me. All grown up and stuff. I can't praise the quality and loveliness of this necklace enough. If it's any sign as to the greatness you'll find with the rest of her things, count me in as a customer for life. The antiqued brass chain is a nice change up to my usual shiny gold or silver ones I already own. 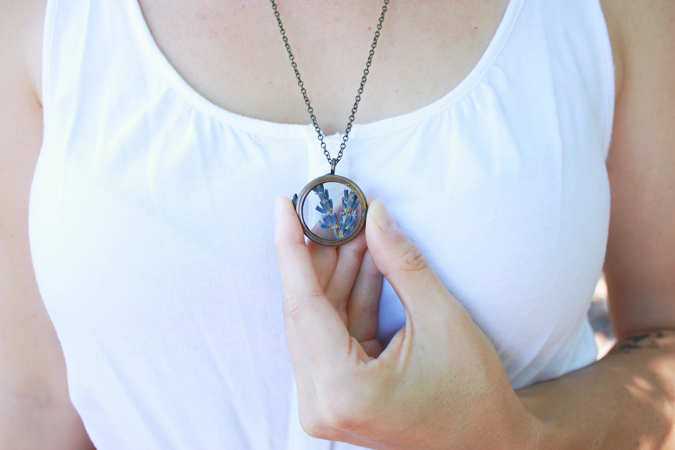 The locket is the ideal size and holds two perfectly colored, vibrant, undamaged little sprigs of lavender. Of course I chose this necklace right? Hello, Sweet Lavender Bake Shoppe. I'm so not the type of girl who likes big gaudy things on, so with the locket at just about an inch wide, it's just perfect. So friends...eeeeeeeek I'm so excited for you! Jennifer has graciously decided to give one seriously lucky SLBS reader her Little Baker Set necklace!!! Yep, you could totally win this beauty! I mean really, look at the detailing on those spoons! I'm in love. 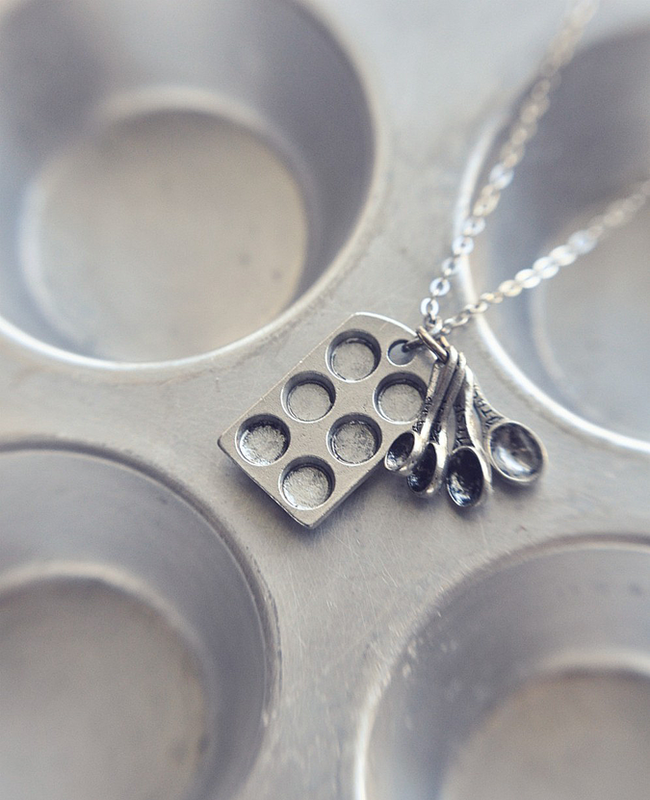 One handmade little baker necklace including a miniature muffin tin and measuring spoons in antiqued sliver with a 17" matching silver chain! Please make sure to enter truthfully as ALL entires will be verified :) One winner will be chosen once giveaway ends and will be emailed. Winner will have 24 hours to email back claiming prize before a new winner is chosen! Good luck friends! This is one you don't wanna miss! 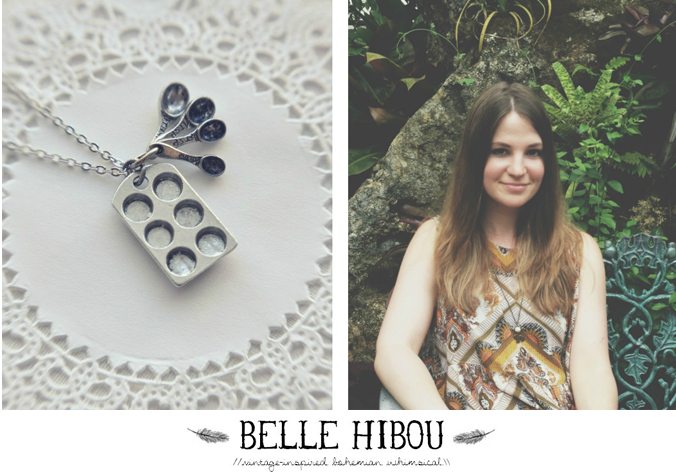 Now for the small print: Belle Hibou provided me with a free sample of the product to review. I was under no obligation to write a positive review. All pictures of myself and opinions are my own. CONTEST OPEN TO US RESIDENTS ONLY. Contest will run for 7 days. Winner will be shown on this blog post upon being chosen AND will be contacted by Sweet Lavender Bake Shoppe via email. Winner has 24 hours to email back and claim prize before a new winner will be chosen. All prizes were graciously donated and shipped to winner by Belle Hibou. That muffin tin necklace is to DIE for! So cute!! 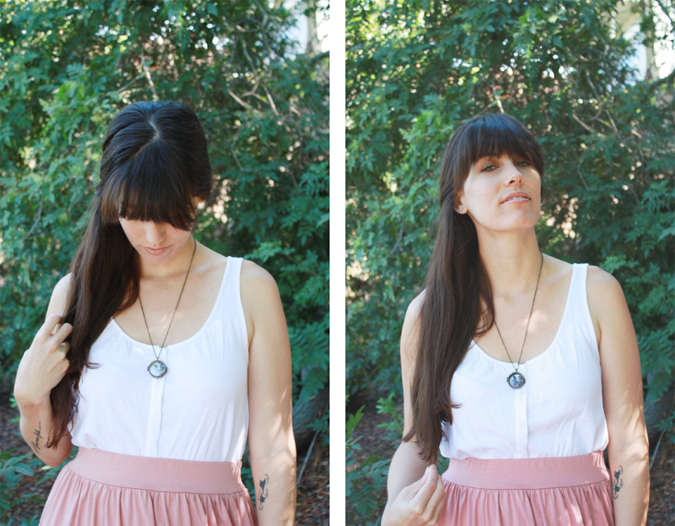 I love the vintage sewing machine necklace! There are so many gorgeous items! I love the frying pan necklace and the wagon- I really love the wagon! 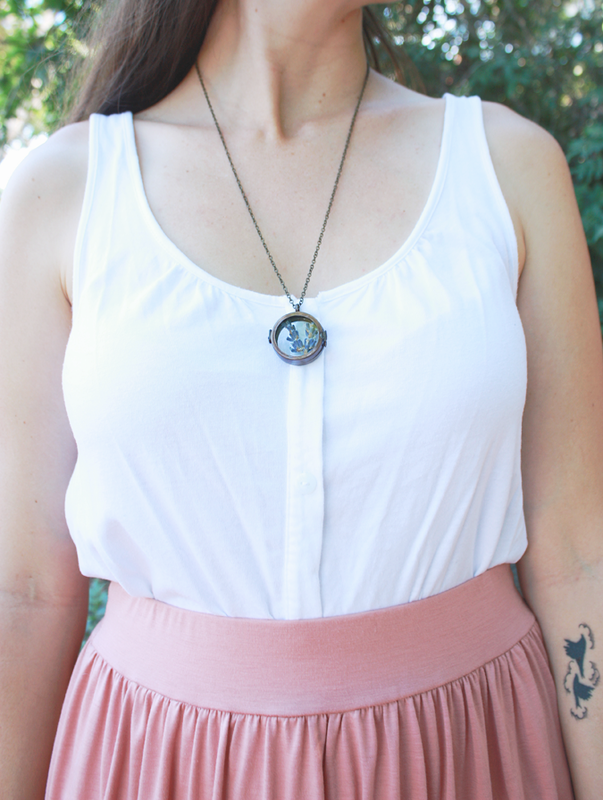 The baker necklace is my FAVE, but I just love the terranium necklace too. I can't believe how affordable everything is in her shop!!! I love her muffin tin necklace, her vintage camera one and the petite chef one. So cute. Definitely on my Christmas shopping list this year. I love the lavendar necklace!!!! I seriously just ordered the nature photographer necklace for my sister but I'd love this one to give to my best friend! I love the Peter Pan collar toddler shirt! And the muffin tin neclace! Wow, there are WAY too many cute things in that store! I can see the breadth of the decision that you had to make in purchasing your necklace! I love all the brass items. I have to say that I want that little baker necklace above all else though. Ah! I want it! I want it! I want it! I love the little baker set and the terrarium pieces! I love fun tiny-charmed necklaces. They're my favorite fashion accessory! Oh my gosh I cannot get over how cute that necklace is!! 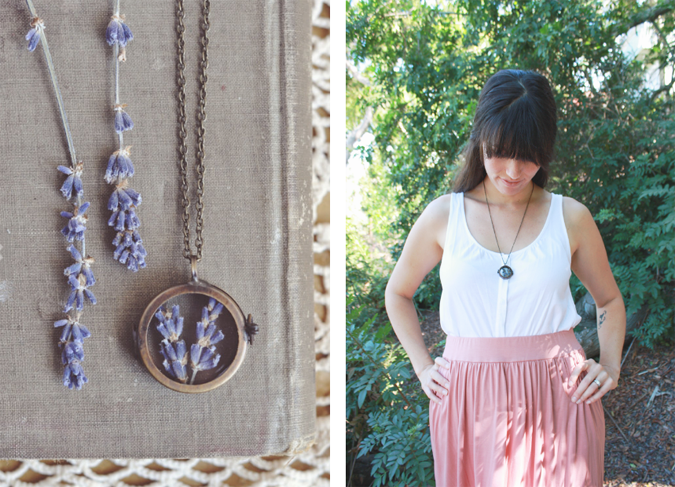 I am officially in love with her fields of lavender necklace! I love the Dream necklace. I LOVE the i heart sewing necklace. Hard choice lots of adorable stuff! I love everything! My favorites are the muffin tin, wanderlust necklace, glass terrarium, acorn, and wanderlust rings. All her jewels are awesome! Such a talent artist! Her site is surely going on my top-bookmarks-list! Good gravy! It would be easier to tell you what I didn't like. A few favorites though were the "wanderlust" necklace, the little mixtape, "out to sea" necklace, and the gypsy caravan necklace. So gorgeous! I love all of it! I die. Too cute to handle! Let's just start by saying how obsessed I am with this necklace! Adorable! And then I saw the mix tape...so cute! 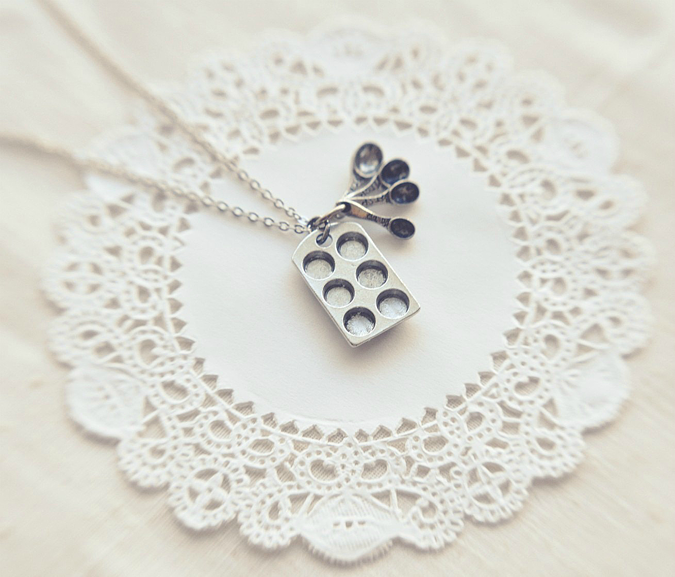 Darling "Little Baker" Necklace...great shop of pretties!